2017's First Place- John Guernsey "Toccoa River Rocks"
Learn how to get ready and compete in a judged plein air paint-out from multiple award winning painter Ed Cahill. Plan and execute paintings for fun and prizes with some smart suggestions that will improve your paintings immediately and enhance your chances for success. Ed will show you how to choose subjects that are relevant and unique and will catch the eye of judges and buyers. Learn how to plan, scout out sites and manage your time. The art of the Quick-Draw will be discussed. Also get a list of do’s and don’ts that will help you plan for this paint-out and those to come. Get your work ready to judge with tips on presentation, framing and timing. Finally Ed will paint with you for two days, one in the charming town of Blue Ridge and also a day along the Toccoa River. This workshop is devoted to teaching all who wish to succeed— beginners to more advanced students. Students should bring their lunches. Recommended Supply List will be provided upon registering. ​ Students need to be prepared for outside painting, weather permitting. Space is limited; please contact Ginger Yaxley at BlueRidgeArts.programming@gmail.com for workshop information and registration. Artworks created during the Ed Cahill Workshop are not eligible for Plein Air Event judging and awards on Sunday, or to hang in the event exhibit. 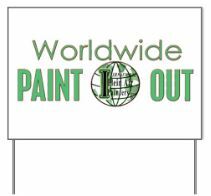 ﻿ ﻿The 2019 Plein Air Event, in conjunction with the 17th Annual International Worldwide Artist Paint Out, offers four days of art and adventure in the North Georgia Mountains. 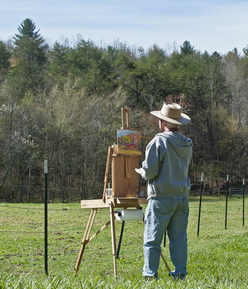 Recently designated as one of the top five Art Towns in Georgia by Georgia Council for the Arts and the Georgia Municipal Association, Blue Ridge provides a multitude of opportunities to capture the spirit of plein air art. The 2019 Plein Air Event provides master workshop, a quick draw event, silent auction and county-wide paint outs, all which culminates in the Plein Air awards and exhibit on Sunday. 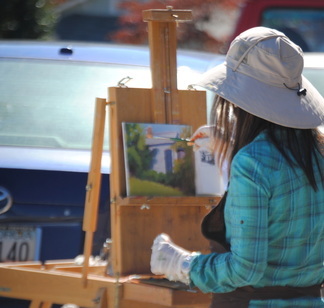 The 2019 Plein Air Event is an open invitation to all artists, amateur and professional, to paint the natural beauty of our area. Artists are welcome to bring their easels and capture the awe-inspiring fall scenes of Fannin County & Blue Ridge, Georgia. This year’s event will offer a special workshop with renowned plein air artist Ed Cahill. Additionally, we are continuing our quick draw event for awards at the one-of-a-kind Horse Creek Stable Rescue Sanctuary on Friday. On Sunday, September 8th, artists will return to the Art Center to submit up to two (2) pieces of artwork for judging and exhibition. Prizes totaling $1,000 will also be awarded for this year’s event. We encourage all participating artists, 18 years or older, to submit their plein air art work for our Plein Air exhibit on display from September 10 – October 13, 2019 in our Studio Gallery. All artwork on display will be exhibited during the Blue Ridge Mountains Arts Association 2019 Fall Arts in the Park festival, which is estimated at over 7,000 attendees in two days. Cash prizes totaling over $1000 will be awarded to those who participate in the various opportunities available throughout our Fall event. Participants must be 18 years or older to submit for prizes and awards. The Plein Air Awards Ceremony will be held Sunday, September 8th at 5pm and is open to the public. All works available from this event will be for sale.